Should you find yourself in the bustling place du Tertre in Montmartre, as so many visitors do, I urge you to take a slight detour to visit Au Lapin Agile, one of the oldest cabarets and restaurants in Paris. Stroll down rue des Saules to number 22, past rue Cortot and the only remaining vineyard in Paris, and arrive at the crossroads with rue Vincent. There in front of you on the corner is a salmon pink cottage and the historical plaque, which tells a wonderful tale. You might easily miss it, but in so doing would have walked past one of the greatest centres of bohemian life in Paris. For it was in this little cottage-style building that Picasso and Modigliani drank, Maurice Utrillo virtually lived and Charlie Chapman once played his violin. The list of glitterati to have visited over the years is dizzying. Dine and/or drink here and you are following in the footsteps of Vivien Leigh, Robert Mitchum, Eleanor Roosevelt, Ernest Hemmingway, Henry Miller, Lawrence Olivier, Lauren Bacall, Joanne Woodward, Paul Newman and Burt Reynolds. The bar was once called “Cabaret des Assassins” (The Assassins Cabaret) because of the paintings of famous killers that adorned its walls. 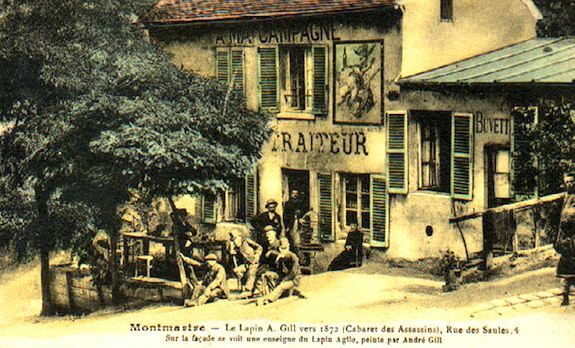 Its name was changed to The Lapin Agile in 1872 when the artist André Gill painted a new sign, showing a cheerful rabbit jumping out of a saucepan. “Le Lapin à Gill” (Gill’s Rabbit) became “Agile” (agile or nimble) and the name stuck. Threatened with closure due to the roughness of the patrons (and the scene of a number of shootings! ), it was saved in 1905 by Aristide Bruant, the famous chansonnier whom Toulouse-Lautrec painted with his huge black hat and red scarf. Bruant handed the tenancy to Frédéric Gérard, an eccentric, kind-hearted musician and potter who understood the area’s clientele well. Gérard drove out the bandits and welcomed Montmartre’s artists, often taking paintings in exchange for drinks. His clients were not rich, but they were brilliant, and The Lapin Agile became a hotbed of artistic debate and argument. Evenings of traditional French song, comedy and poetry reading drew the bohemian crowd. Frédé would play his guitar and artists would drink and argue about the emerging “new art” that was beginning to outrage the art world at the beginning of the 20th century. 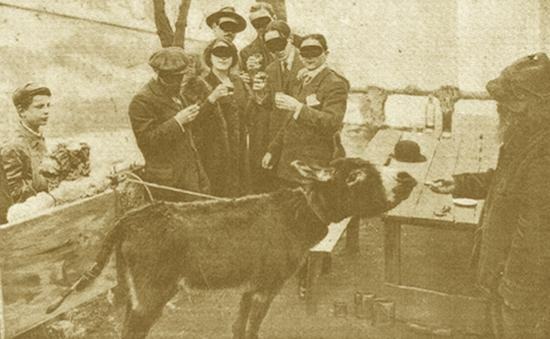 The debates led to a great art hoax, perpetrated by Frédé’s donkey, Lolo. Lolo was a favorite in the neighbourhood. He was sometimes invited to parties in his own right, with Frédé allowed to attend by proxy. 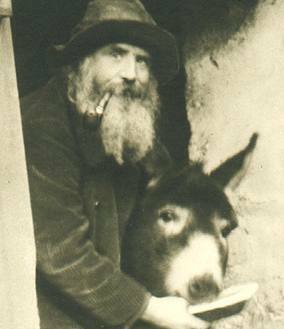 Man and donkey seemed devoted, and thus it seemed only natural that Lolo be included in the trick played on the art world in 1910. Roland Dorgelès, writer and outspoken critic of new art forms, tied a paintbrush to Lolo’s tail and held various vegetables in front of his nose, causing the little donkey to swish his tail with excitement. 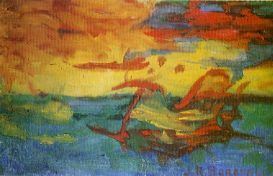 The resulting canvas, named “Sunset Over the Adriatic” by the fictitious Genoese painter Joachim Raphaël Boronali, was exhibited at the Salon des Indépendants , where it earned high praise and was eventually sold for 400 francs. This artwork was the first of the new “Excessivism Movement,” wrote Dorgeles, for a credulous Salon. The trick was then revealed to much hilarity and embarrassment and Lolo’s place in history was assured. Boronali was in fact an anagram of Lolo’s full name, Aliboron. He was named after the mischievous donkey featured in the Fables of Jean de la Fontaine. Despite being a controversial figure in the art world at that time with his challenging new ideas, Picasso was a great patron of the Lapin Agile. He settled a bar bill in 1905 with the painting known as At The Lapin Agile. Frédé can be seen in the background playing his guitar. 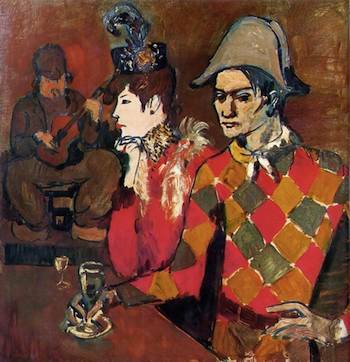 The painting took pride of place in the cabaret until Frédé was forced to sell it in 1912, when it fetched $20. 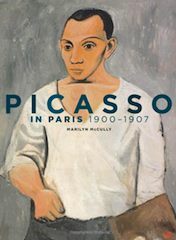 In 1989 Sotheby’s sold the painting for a cool 41 million dollars. You can see a replica of the painting if you visit the cabaret today. A visit will allow you to experience the most authentic of French singing, whilst seated at the simple old tables and chairs that have been there for decades. You can see where patrons have carved their names in to the old wood as you wonder which characters may have been on this same chair in the past! Entry: [2011 prices] €24 for show plus 1 cocktail/drink. 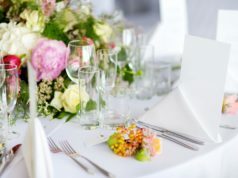 Dinner before show possible for additional cost. PHOTO CREDITS: “Au Lapin Agile” Pablo Picasso, Metropolitan Museum of Art, New York. All other images public domain supplied by author. 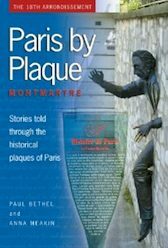 Anna Meakin is the author of Paris by Plaque – Montmartre Vol 1 (The Complete Guide to the Historic Plaques of Paris) and she’s now writing her next book about the Left Bank. Please click on her name to read more about her and her past stories about historic Paris of the past published by BonjourParis. Click on image for more info about these new selections, including “Midnight in Paris” on DVD or Blu-ray. 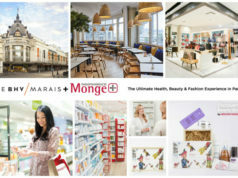 Gourmet Buzz: Chocolate, c’est chic!